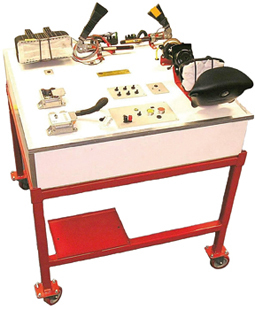 Fully operational Self Restraint System (SRS) Trainer manufactured using original components. Complete with saving and impact sensors, cable reel, driver and passenger air bags and seat belt pre-tensioners. Deployment of air bags is simulated and indicated by a lamp. The driver air bag is displayed in a pre-detonation state so the un-deployed air bag can be inspected and the passenger air bag has been deployed and can be unpacked for inspection.